Do you market to brides and their families? Great item for bridal shows. The wedding planning guide wheel is perfect for wedding planners, bridal shops, wedding reception venues, travel agents and honeymoon spots. With information around the wheel for 16 months before the day through the honeymoon, this piece will help keep your name in front of brides throughout the entire wedding process. Your logo imprinted in black on one side. Set up is 35.00 and minimum is 250. 1.30 ea at 250, 1.15 cents each at 500, 1.05 cents at 1000, 95 cents at 2500. Call for pricing on higher qtys. Imprint area is 1″ x 3″. Ask about a sample. 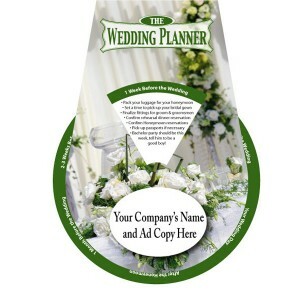 Imprint your logo on this handy wedding planner guide and hand out to brides at bridal shows and more.